Writing Clinic´s Creative Writing Prompts are designed to provide ideas and to get students writing with ease. This worksheet comes with an ´ideas list´/writing prompts so students know what it expected of them. 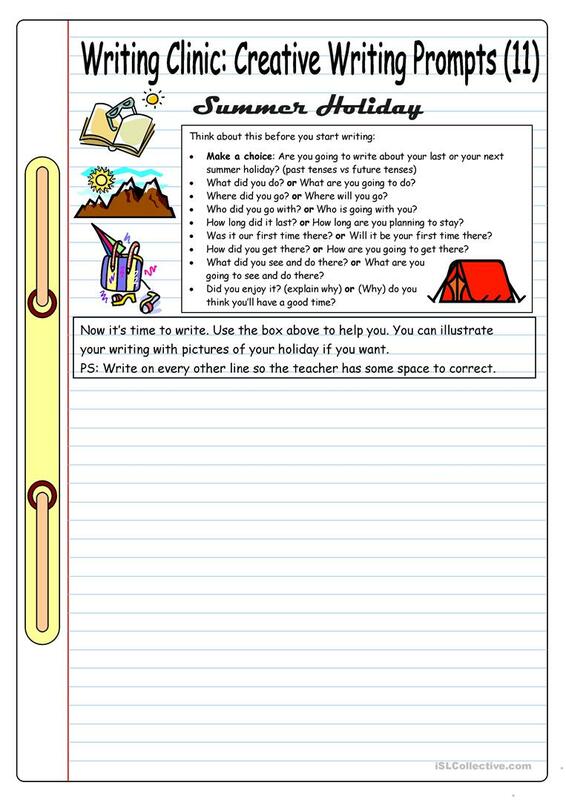 Students should first choose if they´re going to write about their upcoming summer holiday or their last summer holiday. The present downloadable teaching material is meant for high school students and elementary school students at Elementary (A1), Pre-intermediate (A2) and Intermediate (B1) level. It is a useful material for teaching Past simple & continuous tense in English, and can be used for strengthening your pupils' Writing skills. It focuses on the vocabulary topic of Holidays. It includes a key, too.